Global Peace Foundation (GPF) Philippines is making significant strides to transform schools with the help of key partners committed to Global Peace Education (GPE) following the 2017 Global Peace Convention held in Manila from February 28- March 2. Aliaga National High School in Nueva Ecija, the Philippines, is a leading implementer of Global Peace Education’s Character and Creativity Initiative (CCI), a program that is helping to make education more relevant and comprehensive, better preparing graduates to prosper in the workplace, build healthy and resilient families, and contribute to economic development and social stability. 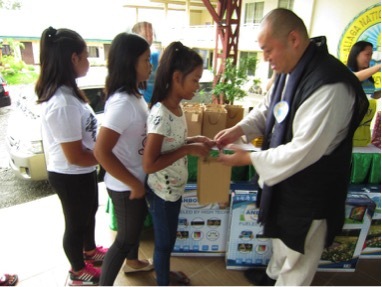 In support of the initiative, the Japanese corporation Fuji Suiso Kansha, a key sponsor of the Manila convention, donated athletic equipment, electronics and school supplies to the high school, presented at a ceremony on May 27. Addressing 1,000 students, CEO Hideo Kawabata expressed his support for the school’s continuous efforts to provide quality education to ensure the youth’s bright future. Fuji Suiso Kansha is a major manufacturer of hydrogen supplement products in Japan. Officials, educators and local stakeholders participating in the ceremony included GPF Philippines Program Director Jocelyn Remigio, school principal Ms. Rowena Caoile (who described the CCI program at Aliaga), Congresswoman Estrellita Suansing, attorney Oyie Umali and the first female Governor of Nueva Ecija, Cherry Umali, represented by Rafael Villanueva and Baby Panlilio. Joanna Gervacio (Department of Education Nueva Division), Dr. Dinah Mindo, Aliaga Mayor Gonzalo Moreno, Mr. Aya Goto (Senior Vice President of Global Peace Foundation) and other representatives from Japan also attended as key partners. 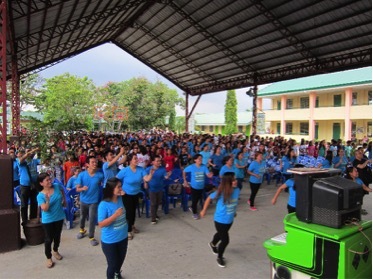 In a display of intercultural and international collaboration, teachers, stakeholders and students danced and sang together to celebrate the development and commitment to the school signified in the ceremony. Global Peace Education, with support from Ministries of Education, corporate partners, and community leaders, are providing resources and strategies to help change classroom and school culture in Brazil, Paraguay, Indonesia, Malaysia, Philippines, Kenya, Uganda, and Nepal.